Covering silage in a pile or bunker silo is a no-brainer decision. When to cover and what with are also important considerations. Researchers at Cal Poly and Kansas State compared silage pile sealing time (immediate versus 24-hour delay) and sealing material (standard plastic alone versus standard plastic plus oxygen barrier film). The results were reported at the 2015 joint annual meeting of the American Dairy Science Association and American Society of Animal Science. Silage was harvested and packed with a payloader. Treatments were imposed and silage was subsequently sampled to 18 inches after 90 days of storage. Silage that was immediately sealed had a lower pH value than the delay-sealed silage. 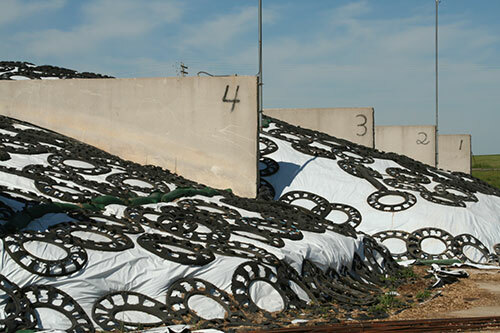 The silage that was delay sealed with standard plastic had a higher ash content, higher neutral detergent fiber (NDF) percent, and lower NDF digestibility than the delay sealed silage using an oxygen barrier film and any of the silage that was sealed immediately. The oxygen barrier film was superior to the standard plastic for eliminating oxygen in the silage. Delayed sealing caused organic matter (OM) losses in the top 18 inches to climb 27.2 percent compared with immediate sealing. Further, delayed sealing with the oxygen barrier film improved OM recovery by 20.6 percent compared to immediate sealing with the standard plastic.